FAIRFIELD TOWNSHIP, Ohio – The Fairfield City School District is denying every allegation in a lawsuit filed by the family of Emilie Olsen. The 13-year-old Fairfield Middle School student killed herself with her father's gun in December of 2014, police said. The federal lawsuit claims Emilie's death resulted from bullying by other students while she attended Fairfield Intermediate School and Middle School, that Fairfield officials – including the superintendent – knew about the bullying, and that they did nothing to stop it in violation of their own policies and the law. In the first of two court filings this month, attorneys for the nine named school defendants and others denied all 22 counts against them. In the second filing, the attorney asked the judge to make a ruling on 10 counts without allowing the Olsens to introduce any evidence. WCPO sought comment on the filings from attorneys on both sides. Pete Ney, who represents the Olsens, said he found it interesting that the school defendants "didn't attack the entire complaint." "The school district has acknowledged the viability of most of the claims in our complaint," Ney said. "We were pleasantly surprised." Ney would not comment further, saying: "We're not real interested in trying this case in the media." Bernard W. Wharton, who represents the school defendants, has not returned WCPO’s call. Not all of the incidents of bullying and harassment claimed in the lawsuit were reported to any school defendants. There is no allegation that school defendants were unaware of the fake social media accounts until Emilie's parents told them. There are no allegations that any of the school defendants were aware of any intent by Emilie to commit suicide. 1) Ten days before she killed herself, Emilie told another Fairfield student in an online chat room that she was the target of mockery and had a plan to end her life. “I’m causing all this trouble on Earth. And people look at me like I’m a freak and I’m tired of it,” Emilie wrote. Then, a few hours later, district officials issued a second response that said, "The middle school administration was advised of previous concerns regarding bullying, however, the district believed the issue had been resolved with the complete satisfaction of the family." The I-Team found emails, school reports, a social media account and more that showed the exact opposite was true. On Aug. 15, 2014, Marc emailed the school again. He said Emilie was “uneasy” about the upcoming school year. He said she discovered several students “who had given her some grief (and) bullying back in the sixth grade” would be in her classes again. He finished the letter by requesting Emilie be moved to a different schedule. The school complied with the request. Emilie's father emailed administrators again on Sept. 8. He thanked them for meeting with Emilie, but said there were still problems. According to her student file, school officials had concerns with Emilie’s academics and behavior in the seventh grade. The concerns led to conversations between administrators and her father on Oct. 17 and Oct. 23, 2014. "I have a bad feeling that if nothing is done then this has the possibility to escalate into something worse," Marc Olsen told school officials. 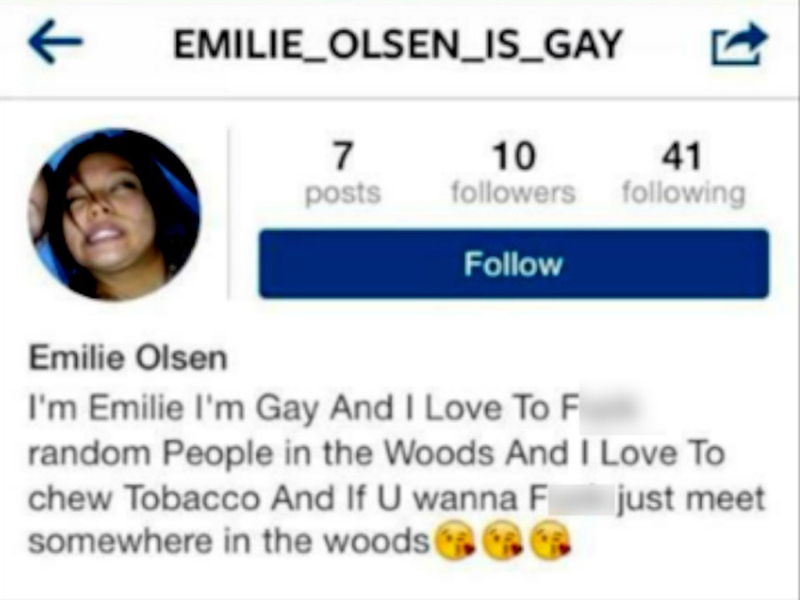 Yet, when asked by the I-Team, then Fairfield City School Superintendent Paul Otten said he had never seen this example of online bullying against Emilie. On Dec. 19 – eight days after Emilie’s death -- Otten released a letter to the community denying bullying played a role in the student’s suicide. Two weeks ago, Otten, one of the defendants in the lawsuit, announced he would resign at the end of the year to become superintendent of Beavercreek Schools near Dayton, Ohio. 4) Less than two months before Emilie killed herself, she was the subject of a fight in the school’s cafeteria, according to incident reports in her student file obtained by the I-Team. The I-Team took these incident reports and other evidence to Fairfield Township Police Chief Matthew Fruchey and Sgt. Doug Lanier. Both men said it was the first time they had ever heard about the documents, the Instagram account and the emails from Emilie's father to administrators. Fruchey said Fairfield Township police opened an investigation after Emilie’s death to determine if there were any “drivers” that would have motivated her to commit suicide. Despite never seeing or asking for her school file, detectives closed the case in five days. The I-Team asked Superintendent Otten and City Attorney John Clemmons why they didn’t share Emilie’s file with police. Their answer: Police didn’t ask for it. “We cooperated fully with the police department to the extent that we believed our cooperation was being requested and sought,” Clemmons said. Violation of O.R.C. 2327.44 for hazing/bullying. Breach of express or implied contract. The suit states: “Emilie's parents tried to stop the bullying and pleaded with certain defendants for help. Defendants failed to stop the bullying and it continued. Consequently, Emilie suffered severe anguish, distress and depression and ultimately committed suicide." The suit claims Emilie wasn't the only victim. "Other students suffered unrelenting bullying and discrimination and two of those students attempted suicide before Emilie's death. Certain of the defendants likewise failed to intervene on behalf of these students," the suit states. The bullying started when Emilie was a fifth grader at Fairfield Intermediate School and continued through the seventh grade at Fairfield Middle School, Emilie’s family claims in the suit.